Don’t you love when you can take something simple and make something amazing? I love to do that with cooking sometimes..you know…open up the cupboards, take a can of this, some leftover goodness, some fresh veggies..and voila! Amazing! It makes me feel like I made something from absolutely nothing! And I love that feeling! I get the same feeling when I use leftover yarn to make something beautiful! Not only did I make a dent in my yarn stash, but I made something from nothing and didn’t spend any extra to do it! 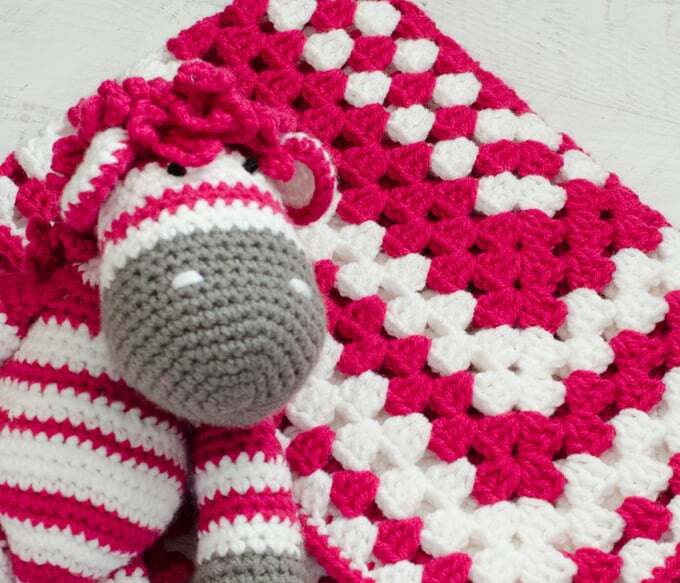 I had some yarn leftover from crocheting this cutie pie Zebra, so I decided to make a Granny Square Baby Blanket to go along with it. If you would like the zebra pattern, head over to Etsy or Ravelry for the paid pattern. And I literally played yarn chicken with this project, guys. 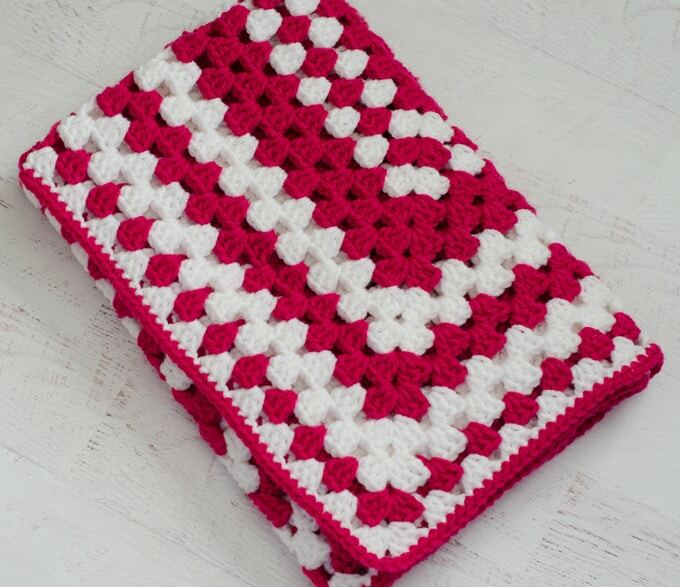 If you decide to make both patterns, I used a skein each of Red Heart with Love and used the leftover pink and white for this project. We all crochet just a bit different so you may get more or less mileage out of your yarn. Because I was using leftovers, I decided to crochet the blanket until I ran out of yarn. I forgot to measure this one before I gifted it, but I’m guessing it turned out to be less than 30 inches square. That’s a pretty small baby blanket. Just right for covering a little one in a stroller or for a little one to drag around the house when she gets a bit bigger. I wanted to show you how to make do with what you have. And how the simple granny square can get a modern look by color placement. The granny square is so versatile. You can make a square blanket as big as you’d like. Or make many granny squares and join them up together. Here is how you crochet a granny square if you need a refresher. Instead of a normal row-by-row pattern, I’m just going to give you basic directions. Feel free to change colors as you’d like. When you start a new color, join it with a slip stitch to any space and chain 3. The chain 3 counts as the first double crochet. Then continue as normal for the square. Row 24 (or whatever row is your last row): With pink, single crochet around blanket as follows: work 1 sc in each dc from the prior row, work 1 sc in the chain of the ch-1 spaces, work 3 sc in the corner spaces. Fasten off and weave in ends. And there you go! You made a granny square baby blanket! I love seeing your finished projects! If you share your Granny Square Baby Blanket on Instagram, be sure to tag me @crochet365knittoo. If you are on Facebook, stop over to the Crochet 365 Knit Too Facebook page and share a photo! I’d love to see your work! Written pattern copyright Cheryl Bennett 2017, all rights reserved. Please do not reprint or repost this pattern. 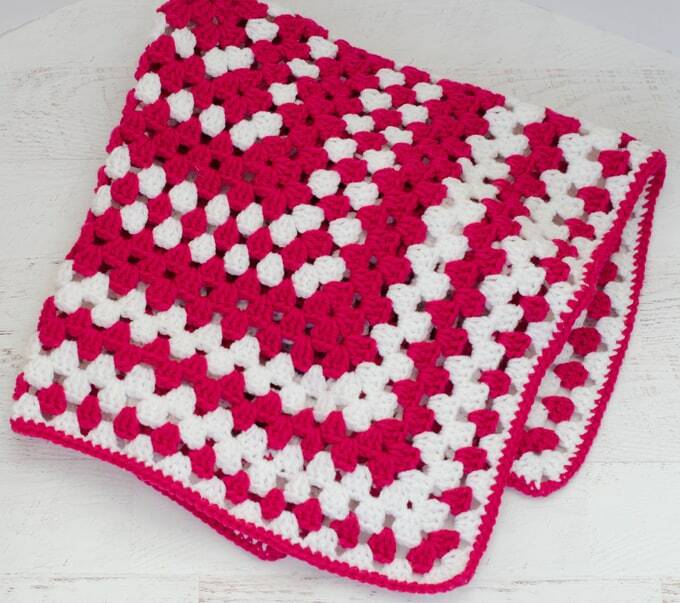 If you would like to share this Granny Square Baby Blanket pattern with others, just link to this page. To print or download without ads, use the Print Friendly button below or go to PrintFriendly.com. You can also copy and paste the pattern into your word processing software. If you’d like to make items for sale from this pattern, please visit my About page for more information.